Five years ago, in 2012, I decided to experiment in improving my teaching by creating a flipped classroom (and semi-MOOC) for my course “Business Analytics Using Data Mining” (BADM) at the Indian School of Business. I initially designed the course at University of Maryland’s Smith School of Business in 2005 and taught it until 2010. When I joined ISB in 2011 I started teaching multiple sections of BADM (which was started by Ravi Bapna in 2006), and the course was fast growing in popularity. Repeating the same lectures in multiple course sections made me realize it was time for scale! I therefore created 30+ videos, covering various supervised methods (k-NN, linear and logistic regression, trees, naive Bayes, etc.) and unsupervised methods (principal components analysis, clustering, association rules), as well as important principles such as performance evaluation, the notion of a holdout set, and more. 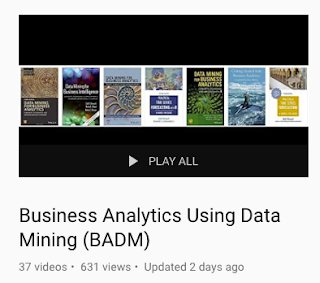 I created the videos to support teaching with our textbook “Data Mining for Business Analytics” (the 3rd edition and a SAS JMP edition came out last year; R edition coming out this month!). The videos highlight the key points in different chapters, (hopefully) motivating the watcher to read more in the textbook, which also offers more examples. The videos’ order follows my course teaching, but the topics are mostly independent. The videos were a big hit in the ISB courses. Since moving to Taiwan, I’ve created and offered a similar flipped BADM course at National Tsing Hua University, and the videos are also part of the Statistics.com Predictive Analytics series. I’ve since added a few more topics (e.g., neural nets and discriminant analysis). The audience for the videos (and my courses and textbooks) is non-technical folks who need to understand the logic and uses of data mining, at the managerial level. The videos are therefore about problem solving, and hence the “Business Analytics” in the title. They are different from the many excellent machine learning videos and MOOCs in focus and in technical level — a basic statistics course that covers linear regression and some business experience should be sufficient for understanding the videos. For 5 years, and until last week, the videos were only available to past and current students. However, the word spread and many colleagues, instructors, and students have asked me for access. After 5 years, and in celebration of the first R edition of our textbook Data Mining for Business Analytics: Concepts, Techniques, and Applications in R, I decided to make it happen. All 30+ videos are now publicly available on my BADM YouTube playlist. Currently the videos cater only to those who understand English. I opened the option for community-contributed captions, in the hope that folks will contribute captions in different languages to help make the knowledge propagate further. This new playlist complements a similar set of videos, on “Business Analytics Using Forecasting” (for time series), that I created at NTHU and made public last year, as part of a MOOC offered on FutureLearn with the next round opening in October. Finally, I’ll share that I shot these videos while I was living in Bhutan. They are all homemade — I tried to filter out barking noises and to time the recording when ceremonies were not held close to our home. If you’re interested in how I made the materials and what lessons I learned for flipping my first course, check out my 2012 post. Previous Previous post: Data mining algorithms: how many dummies?